Classy textured surface with the name embossed for fun and to identify its uniqueness. No more lost or wasted DRINKS. The DOM is not limited to only the six important pieces of equipment it can also be used to hold a cap, visor, towel, under armor, windbreaker catchers gear, and coaches gear. On the same hooks under the Glove or Helmet. Discipline - Trains players to organize value and protect their equipment. Confidence - Players are relaxed and calmer, no more feelings of urgency or panic scrambling to find their equipment during the transitions from Offense to Defense. Organization - Bat, Ball, Glove, Batting Gloves, Helmet, Jacket, and fluids/drink in one place. Efficiency and Time Management - Quick efficient calm transitions from Offense to Defense. Money Savings - No misplaced equipment and drinks, no more unnecessary damage to equipment, including dropping a $200 to $300 bat into a steel sleeve or under a bench to be stepped on or against the fence to be kicked and trip over. 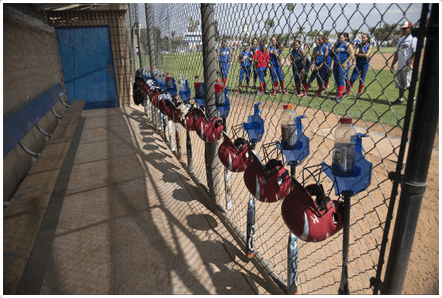 Focus - Increased focus on the Fun, Strategies and Excitement of the game and not having to be focused and detracted about player's safety in the dugout and tracking equipment. Players will now know exactly where to find each piece of their expensive equipment. No more hurried and panicky searches at those critical moments transitioning from offense to defense.